Blackford is a village in Cumbria close to Gretna. Blackford means what it says, a black ford or river-crossing. However, unlike other places of the name, it is a mix of Old English and Old Norse: the first element is Old English blǣc "black", while the second element is Old Norse vathr / vaőr, ford, river crossing, which usually occurs as -wath in place-names with this element (e.g. Wath upon Dearne). The name was recorded as Blakiwaith in 1165. ^ Ordnance Survey: Landranger map sheet 85 Carlisle & Solway Firth (Gretna Green) (Map). Ordnance Survey. 2012. ISBN 9780319231579. 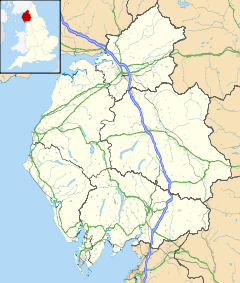 Wikimedia Commons has media related to Blackford, Cumbria. This page was last edited on 19 October 2018, at 00:46 (UTC).